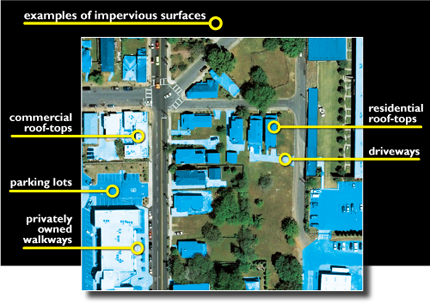 Impervious surfaces such as rooftops, paved driveways, patios, and parking lots are major contributors to stormwater runoff entering the District's combined sewer system. This adds significantly to pollution in the Anacostia and Potomac Rivers and Rock Creek. The Clean Rivers Impervious Area Charge (CRIAC) is a fair way to distribute the cost of maintaining storm sewers and protecting area waterways because it is based on a property's contribution of rainwater to the District's sewer system. Because charges are based on the amount of impervious area on a property, owners of large office buildings, shopping centers and parking lots will be charged more than owners of modest residential dwellings. All residential, multi-family and non-residential customers are billed a CRIAC. The charge is based on an Equivalent Residential Unit (ERU). An ERU is a statistical median of the amount of impervious surface area in a single-family residential property, measured in square feet. The approved monthly ERU values for FY 2019 and FY 2020 are $23.00 and $25.58 respectively. Our new Impervious Area Calculator allows you to estimate the impervious area charge for a property. You can also calculate how much your Impervious Area Charge would increase/decrease if you add or remove things like a garage, pool, driveway, patio, walkway or other impervious surface. If you are a current DC Water customer, with a My DC Water Login, you can download the current imperious area details for your property by clicking on “Clean Rivers Charge”.